Anthony Caterina’s father liked MG sports cars. When Caterina was growing up in Niagara Falls, N.Y., there always seemed to be a new MG in the driveway that was the current object of his dad’s attention. Son and father even worked together on a few of the British cars. Caterina recalls that about 30 years ago his father learned that the MG brand was nearing the end. He wanted one of the last new ones, so he took action and went to the nearby community of Lockport, N.Y., where the MG dealership was located. 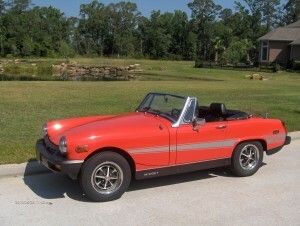 There he found a new 1979 MG Midget Rally Sport model. It was painted Vermillion and on the sides were silver decals emphasizing the fact that this was a Rally Sport model. “In May 1980, my father paid $5,572 for the new MG,” Caterina said. For the next three decades, the MG never left the garage in any kind of weather, except dry and sunny. During that 30-year period it was driven an average of about 85 miles a year. Caterina says his father would sometimes drive the flashy MG to his shop and park it near the street to attract attention for his business. Last year, as his father’s health was failing, arrangements were made to send the MG to Houston, where Anthony now lives. Before the plans were complete, his father died in November 2009. The plans to transport the MG were completed by the family earlier this year. When Caterina got word that the MG was on the way he had the truck driver deliver it to a restoration shop in order to have the car examined. After the MG arrived in Texas, the technicians at the shop began a thorough inspection. They informed Caterina that there was no compression in the four-cylinder engine. “Fix the car,” Caterina told them, expecting that task to take months. A few minutes later, Caterina received a telephone call informing him that the problem was fixed. It seems that his father had installed a hidden kill-switch and had not passed that information to anyone. With the kill-switch turned off, the car came to life and received a clean bill of mechanical health. An anxious Caterina took a trip around the block. He noticed that the ancient 13-inch tires had cracks that had cracks. New tires were mounted on the stylish wheels in April. Two of the chrome trim rings that add beauty to the wheels were damaged, but Caterina was successful in finding replacements. Not all of the well-preserved paint is original. Caterina explains that a garage door spring broke and the sharp end of the spring snapped back across the engine hood of the MG. He says the hood was not dented but the paint was severely scratched. The restoration shop perfectly matched the color and the hood is once more scratchless. The diminutive car has an equally small windshield. It is so small that a total of three tiny wipers stand ready to clear any raindrops. A spare tire gobbles up much of the space in the trunk. A tonneau cover and boot, along with tire changing equipment, occupies the rest of the trunk. To expand cargo capacity, a small, useful luggage rack is mounted atop the trunk lid. The top is black, as is the interior upholstery, in a car without air conditioning. “It’s hot to sit in,” Caterina says. This entry was posted in Classic Cars of 1970s, Let's Restore this Old Car -- Classic Classics, MG. Bookmark the permalink.